Have you started your Holiday Shopping yet? This time of year is always so busy shopping-wise! So, I am picking out some of my favorite Holiday Beauty items to add to your gift idea list! As always, Laura Mercier's Holiday gift lineup is stellar! If you have a makeup lover in the family or perhaps if you need a little gift for yourself, this Holiday 2013 Laura Mercier Holiday Collection assortment is for you! I had the opportunity to try out a couple items from this year's Laura Mercier Holdiay Collection: the Souffle Body Creme Sampler and the Luxe Colour Wardrobe Dual Decker Colour for Eyes & Cheeks. To find out more details about these products and see photos and swatches, please click "read more" below! 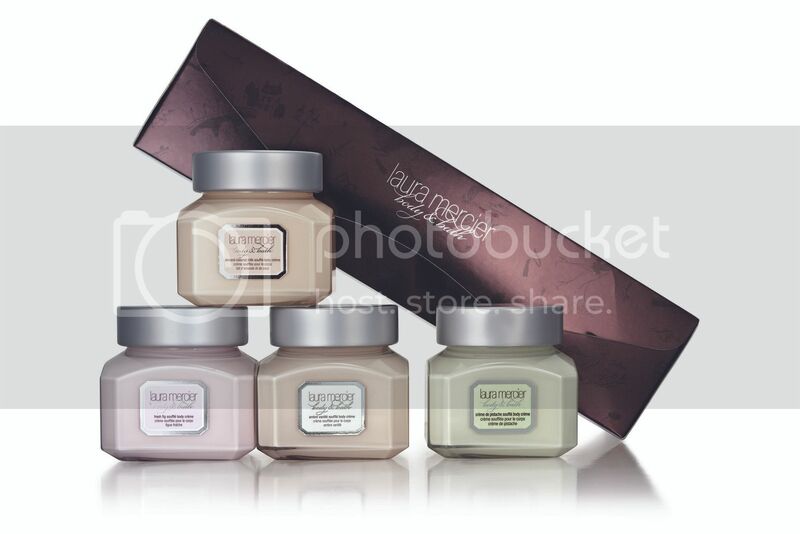 Laura Mercier's bath and body products are so luxurious! I absolutely do not miss out on a chance to try out anything from this indulgent bath line! Not only are the products rich and moisturizing, but also the scents are really amazing, too. If you have never tried any of Laura Mercier's bath and body products, the Holidays are the time to do it because the Holiday Collection offers such a nice introductory assortment. 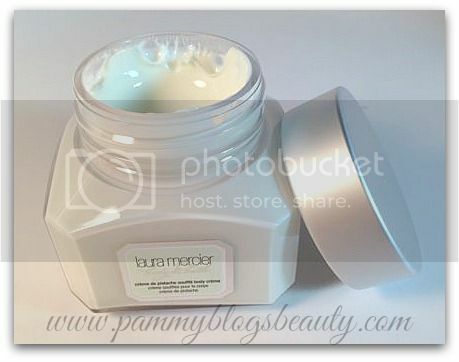 The Souffle Body Creme Sampler offers 4 of Laura Mercier's best selling bath & body scents: Ambre Vanille, Almond Coconut Milk, Creme de Pistache, and Fresh Fig. These little jars are 4 oz each. The cremes are rich and super hydrating and richly scented. You can really wear these on their own and skip perfume or you can layer with a perfume scent. I love applying these after a bath or shower. This set retails for $60. Eight eyeshadows in Morning Dew matte, Coffee Ground matte, African Violet luster, Ballerina Pink sateen, Deep Night matte, Dusk luster, Sable sateen and Crystal Beige luster. Three Tightline Cake eyeliners in Black Ebony, Ground Espresso and Bleu Marine. Two Second Skin cheek colors in Barely Pink and Heather Pink. Face highlighter in Golden Shimmer. Longwear Crème eye pencil in Espresso. What a gorgeous palette!!! I absolutely adore this palette! It really has everything you need for a complete face. Yes, it is expensive. However, look at how many products you get with this kit! The top tray of the palette swivels out to reveal the bottom tray. The bottom tray holds the pencil liner, a brush, the tightline cake liners, the face highlighter, and the blushes. I am a huge fan of Laura Mercier's Cake liners! Actually, my go-to liners of choice are all powder/cake type liners. I just love the soft look that it gives and they control that you get with a brush. I just lightly mist the brush with spray water and dip it into the cake liners. So easy!!! I also really love the blushes in this kit! Such pretty and vivid colors for winter! 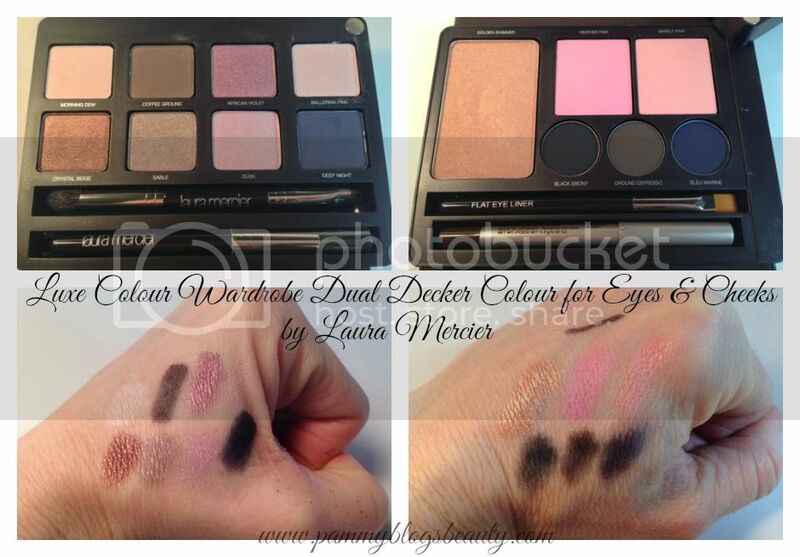 Have you seen the Laura Mercier Holiday Collections at your local Mall yet? In addition to these items, Laura Mercier is also offering baked eye color palettes, colour to go palettes, a travel brush collection, a creme eye pencil collection, a caviar eye stick collection, a mini lip glace collection, a bath and body quartet, a bath and body duo, a hand creme sampler, and candles. What are you eyeing from the line?